Another Kentucky bus accident has happened in Jefferson County, Kentucky involving a JCPS School Bus. The Accident was reported to have occurred Wednesday morning around 8:13 a.m. while the bus was stopped at a railroad crossing. While the bus was stopped at the crossing, it was rear ended by a car. Fortunately, no injuries were reported. People injured in bus accidents have legal rights under Kentucky law and can seek to be compensated for damages and injuries stemming from the bus accident. Five students aboard a Jefferson County, Kentucky School Bus were has resulted in minor injuries. The accident occurred around 6:55 a.m. at Six Mile Lane and Brookhollow Drive. Bus accidents can be legally complicated when they involve the school system due to immunity issues. Charter bus accidents carrying passengers on out of town type excursions can also have complex legal issues involved in liability. For more links to information on bus accidents and injured persons legal rights, click here to link to our firm’s web pages. (click for links to more information). The accident happened around 7:10 a.m. while a student was trying to board a school bus. Reports indicate that Scottie Ingle, age 30, was driving his vehicle southbound on KY-519 when he tried to pass a school bus and struck a student who was attempting to board the bus. The child was airlifted to University of Kentucky Hospital to be treated for his injuries. The parents of this child have civil legal recourse under Kentucky law for the injuries their child has suffered. A parent, on behalf of their child, can seek to legally recovery any medical bills related to this accident (which will likely be substantial considering that the child had to be airlifted to the hospital), pain and suffering damages/compensation for the child, and compensation for any future medical bills or permanent impairment the child may suffer. Additionally, the parents also may have legal compensation owed them as relates to their child’s injuries and accident. Four Frost Middle School students were injured in a Louisville, Kentucky auto accident which involved their school bus and a car that ran a red light. The bus had been transporting approximately 50 students, when another car disregarded a red light and struck the bus. The four students injured where taken to the hospital with minor injuries. The families of the injured students can seek justice for their children, including the costs of their medical treatment and any pain & suffering, through claims against the at-fault driver’s insurance. An automobile accident occurred in Louisville, Kentucky involving a Jefferson County School Bus and a truck. The Kentucky car crash occurred Tuesday morning at Fern Valley Road and Old Fern valley Road. The Driver of the truck was injured and luckily none of the children on the bus were injured. This accident involved bus No. 9926, and was carrying children to multiple different schools. Kentucky school bus accidents can be very serious due to the lack of seat belt restraints and number of children riding in the vehicle. Fortunately no children were injured in this crash. Over 20 Children were injured this week when an accident occurred between a car and the school bus on U.S. 421, near the Rockhouse Community, in Leslie County, Kentucky. 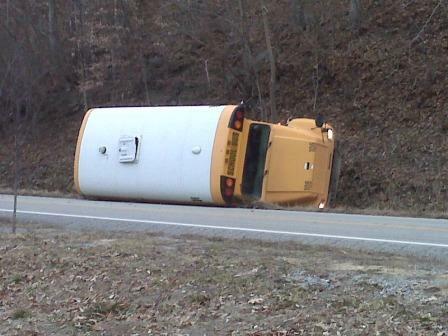 The school bus was knocked on its side as a result of the crash. Initial reports specify there were 28 children on the bus, all of whom were taken to the hospital. The school bus was headed east on U.S. 421 when the accident occurred with a vehicle traveling westbound on U.S. 421. While police have not yet specified charges, they have reported that charges are pending against Roger Sizemore, the driver of the vehicle which caused the bus to crash. From the initial reports, the driver of the car is at fault and will be liable for the injuries to the children. An accident of this magnitude, involving so many children, can rock the foundation of a small community. As information is released, this report will be updated. The Victim, age 56, of Louisville, Kentucky died Monday night due to injuries he sustained after his car broke down on the expressway, and he was attempting to flag down help. The Victim was stuck by another vehicle on the ramp from Phillips Lane and Louisville Airport. While no charges have been pressed against the other driver, fault in this case is still undetermined. The Victim leaves behind a wife and children. Vandeveer’s family has suffered a huge lose, for which the Kentucky Courts will allow an avenue for recovery. The Victim’s family will need to setup an Estate through Probate, which will empower them to handle wrapping up his affairs and transferring his assets to his wife and children. Additionally, the Estate will be in a position to seek recovery of medical bills, funeral bills, loss of consortium claims, and a claim for a lifetime of lost wages/earning potential from both the other driver & the other driver’s insurance company and from the Victim’s own insurance company. This type of action is known as a wrongful death claim. 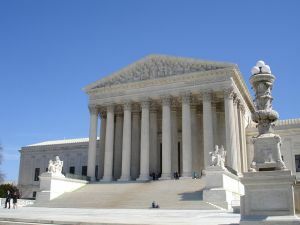 While the legal system cannot bring the Victim back or lessen the pain his family is experiencing, it can provide a recovery financially for the family so they can be assisted in moving their lives forward and provide the money that they have lost as a result of this tragedy and the money that the Victim would have earned for the family over his lifetime. Fault isn’t an issue at this time, and unless a person is 100% at fault, Kentucky law allows for a recovery of damages on a percentage basis. This is known as comparative fault under Kentucky Law. For example, under comparative fault and Kentucky law, a person injured or killed could bear 80% fault for an accident and the other party only bear 20%, and the party injured or killed who bore 80% fault could seek recovery of the 20% from the other party and their insurance company. Under such a theory, if the damages were calculated at $500,000.00 from an accident where a person was injured or killed, the recovery allowed under such an 80/20 split of fault would allow the injured or killed party to recovery $100,000.00. Jefferson County Kentucky Prosecutors Appealing Ruling In DUI Case: DUIs Cause Serious Injures & Deaths Everyday Across Our Country. At 5:00 a.m. in January 2010 in Louisville, Kentucky, police were called to the scene of a parking lot where a man was passed out asleep in his truck. The keys were in the ignition, the truck was running, the man’s foot was on the accelerator, one hand was on the steering wheel, the other hand was on the gear shift, and the man was unconscious. The police officers reported hearing the engine running loudly from more than a block away, due to the truck being in park but having the gas pedal stepped on by the unconscious man. At the scene, the police had to break out the window because the man would not wake up and respond to the officers, and officers were afraid the vehicle would either caught on fire or jump into gear and propel itself through the parking lot. The man admitted to police that he had been drinking at 4th Street Live and the breathalyzer given at the scene showed the man was nearly 3 times the legal limit of impairment. He was dangerous and could have injured or killed someone in the state he was in and driving a car. However, in October 2010, the Jefferson District Court Judge ruled that the man should not have been charged with DUI, because he was asleep and did not have physical control of the vehicle. (3) The vehicle’s location and all circumstances explaining how the vehicle got there; and (4) The intent of the person behind the wheel. 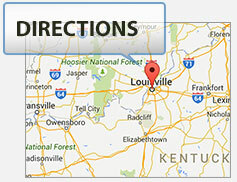 Kentucky Auto Accidents: What To Consider At The Time Of Minor Collisions? If involved in an automobile accident in Kentucky, here are a few things to consider in minor collisions. These suggestions and issues are not applicable in all situations, including major collisions involving serious injury or death. 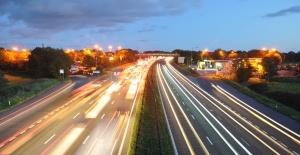 Moving your vehicle once the accident has occurred, prior to the police arriving, is not recommended, even if you are impeding the flow of traffic. The reason for such is if you desire to have a police report taken related to the accident, the road and weather conditions, and assessment of fault, the police will likely not take one if the vehicles have been moved. If the vehicles have been moved prior to the police arriving, the police will likely only issue you and the other driver a civil report to fill out. Stories may differ after an accident, and it may be beneficial later to have a police report to substantiate your version of the events. Usually, if traffic is impeded, the police will arrive, take a look at the position of the vehicles, and then instruct the drivers to move the vehicles to allow for traffic to continue as normal. This will allow the police to be in a position to thoroughly complete a report. (i) may not have current and up to date coverage, and thus be uncollectable from. If the police take a report, and the other driver fails to have insurance or gives the police false information, such will be documents and be beneficial to you later when trying to resolve the matter with that driver or your own insurance company. (ii) may change their story about what really occurred, the extent of the injuries involved, or the extent of the damage involved. If the other party is going to lie, its better that they are forced to attempt to do it immediately and to the police (lying to a police office, who is taking an official report, can be a crime). Additionally if stories are going to vary about what occurred, its better to have a police office take a report and potentially be a witness later to substantiate what he or she witnessed at the time of arriving upon the scene of the accident.